Are Your Remote Bookkeeping Costs Setting You Back Annually? The Institute of Certified Bookkeepers (ICB) have announced the average costs per hour for paying remote bookkeeping fees, which have remained constant for at least the previous three years! The average price point for bookkeeping is between $50 to $70 per hour. Although the average prices for BAS can sit around $100 to $150 per hour, it appears the prices of $50 through $70 are the more common charge out rates for BAS as well as other bookkeeping tasks like payroll. Whilst high end consulting work can go for between $100 to $150 per hour. (Note that this latter charge out rate was given by only 20% of responders the the survey. BOSS offers a fixed fee arrangement whereby clients are charged for each job ensuring that clients know exactly what they will be charged before the work starts. Although accountants do remote bookkeeping work, all our highly qualified accountants always work from our office. They never work from home to make sure your security is ensured. Are You Stagnant Due to a Case of Better the Devil You Know? Businesses can often get into a rut and end up not making the necessary changes it needs to keep growing. Rather than clinging onto what needs altering within your business, it makes better sense to evaluate what is working and what is not, what can save you money and what is costing you unnecessarily. Relief from budget overruns……. Forever! Fully qualified bookkeepers with years of experience! I Want to Make Sure I’m With a Company That Knows the Ropes, How Long Has BOSS Been Around? With 14 years experience we have “seen it all” and have come out the other end fully knowledgeable on what our clients want and need in accounting and bookkeeping today. 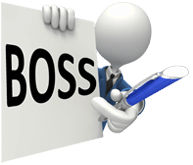 BOSS is one of the oldest remote bookkeeping companies in Australia today and can offer businesses a service where bookkeepers follow our client’s own procedures and have direct contact with bookkeepers via skype and email. All jobs can be performed on a fixed fee basis keeping monthly costs down for businesses where bookkeeping is concerned.